Like its predecessor, Hornet’s Nest, Demon Quest is a five-disc saga of linked stories written by Paul Magrs, of which this is the first instalment. 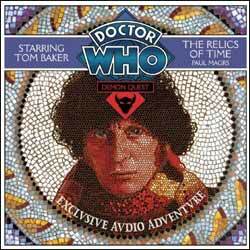 You don’t need to have heard Hornet’s Nest in order to follow the story: the Doctor (Tom Baker) explains all you need to know in an opening monologue that is pleasantly reminiscent of the beginning of The Pescatons (the first-ever commercially released Doctor Who audio-exclusive adventure, which similarly starred Baker). For those of you who have already heard Hornet’s Nest, all the familiar friends return: Nest Cottage, Mrs Wibbsey (Susan Jameson) and Mike Yates (Richard Franklin). Though Yates makes only a cameo appearance in this instalment, Mrs Wibbsey is elevated to the status of full-fledged companion, as she accompanies the Doctor in the TARDIS, which is only able to travel through time, not space, after she inadvertently sells a vital component at a bring-and-buy sale. Jameson is a good foil for Baker, who had wanted an older, more eccentric female (such as Sylvia Coleridge from The Seeds of Doom or Beatrix Lehmann from The Stones of Blood) as a companion during his time on the television show. An improvement upon Hornet’s Nest is the lack of past-tense narration. There is still some of it, but the majority of the scenes in The Relics of Time comprise dialogue between two or more of the cast, which also includes Nigel Anthony as the mysterious wizard, and Rupert Holliday Evans and Kate Sachs as ancient British warriors. This feels more like an audio drama than a talking book. This time around, the linking theme of the saga is the quest to track down the TARDIS’s missing spatial geometer (one small part of which is recovered during this instalment), using four strange relics as clues for the ship to home in on. It’s a similar concept to the Key to Time series, and the era is further evoked by a brief reference to K-9. Unfortunately, the set-up for the premise, involving the Doctor and Mrs Wibbsey in the present day at the start of the CD, is more interesting than their eventual journey to Roman times. However, if Demon Quest pans out anything like Hornet’s Nest did, then the whole will prove to be greater than the sum of its parts. Here’s to the next leg of the quest.